For other uses, see El País (disambiguation). El País ( listen (help·info); literally The Country) is a Spanish-language daily newspaper in Spain. According to the Office of Justification of Dissemination (OJD) it is the second most circulated daily newspaper in Spain as of December 2017[update]. It's by the number sales in 2018 were, on average, 60.000 according to internal audits, more than 70% less than a decade prior. The current editor, Soledad Gallego Díaz, has been brought to court after dismissing five employees for what the accusers mainatin are political and ideological reasons. Its headquarters and central editorial staff are located in Madrid, although there are regional offices in the principal Spanish cities (Barcelona, Seville, Valencia, Bilbao, Santiago de Compostela) where regional were produced until 2015. El País also produces a world edition in Madrid that is available online in Brazil (in Brazilian Portuguese) and Hispanic America (in European Spanish). An English edition began as a print edition in 2001, available as a supplement in what was then the International Herald Tribune, later The Global New York Times. Since 2014, it has been an exclusively digital project. El País was founded in May 1976 by a team at PRISA which included Jesus de Polanco, José Ortega Spottorno and Carlos Mendo. The paper was designed by Reinhard Gade and Julio Alonso. It was first published on 4 May 1976, six months after the death of dictator Francisco Franco, and at the beginning of the Spanish transition to democracy. The first editor-in-chief of the daily was Juan Luis Cebrián. El País was the first pro-democracy newspaper within a context where all the other Spanish newspapers were influenced by Franco's ideology. The circulation of the paper was 116,600 copies in its first year. It rose to 137,562 copies in 1977. El País filled a gap in the market and became the newspaper of Spanish democracy, for which role El País was awarded the Prince of Asturias Award for Communication and the Humanities in 1983, at a time when the transition from Franco's dictatorship to democracy was still developing. The paper's first Director (until 1988) was Juan Luis Cebrián, who came from the daily newspaper Informaciones. Like many other Spanish journalists of the time he had worked for Diario Pueblo (meaning People's Daily in English) which was a mouthpiece for the Francoist sindicato vertical. Its reputation as a bastion of Spanish democracy was established during the attempted coup d'état by Lieutenant Colonel Antonio Tejero of the Guardia Civil on 23 February 1981. During the uncertain situation of the night of 23 February 1981, with all the members of parliament held hostage in the Congress building and with tanks on the streets of Valencia, and before the state television station could transmit a speech by King Juan Carlos I condemning the coup, El País published a special edition of the newspaper called 'El País, for the Constitution'. It was the first daily paper on the streets that night with a clear pro-democracy position calling on citizens to demonstrate in favour of democracy. It was widely discussed in the news media that the then director of El País, Juan Luis Cebrián, telephoned the then director of Diario 16, Pedro J. Ramírez, in order to propose that both newspapers work on a joint publication in defence of democracy and Ramírez refused, claiming that he would prefer to wait a few hours to see how the situation developed. Diario 16 was not published until after a television broadcast by the king. Along with its commitment to democracy before the attempted coup of 23 February 1981, the Spanish Socialist Workers' Party's election victory in 1982 with an absolute majority and its open support for the government of Felipe González, meant that El País consolidated its position during the 1980s as the Spanish newspaper with the most sales ahead of the conservative leaning ABC. In 1986 El País was the recipient of the Four Freedom Award for the Freedom of Speech by the Roosevelt Institute. In 1987 El País received the largest amount of the state aid. Both the rigorous journalistic standards and the fact that it was the first Spanish newspaper to establish internal quality control standards have increased the standing of El País. It was also the first Spanish daily to create the role of "Reader's Advocate" and the first to publish a "Style Guide", that has become a benchmark for quality amongst journalists. El País has also established a number of collaborative agreements with other European newspapers with a social democrat viewpoint. In 1989, El País participated in the creation of a common network of information resources with La Repubblica in Italy and Le Monde in France. At the beginning of the 1990s, El País had to face a new political and journalistic challenge. The increasing political tensions caused by corruption scandals involving the socialist government of Felipe González polarized both the Spanish political classes and the press of the left and right wings. Since that time both the Partido Popular and the media aligned with it have accused El País and the other companies owned by PRISA. along with Sogecable of supporting the interests of the Spanish Socialist Workers' Party (PSOE). Despite this, El País has managed to maintain its position as the best selling generalist daily in Spain, although its lead over El Mundo has been reduced. Both in 1993 and 1994 it was the best selling newspaper in the country with a circulation of 401,258 copies and 408,267 copies, respectively. In the period of 1995–1996 El Pais had a circulation of 420,934 copies, making it again the best-selling paper in the country. Since October 2001, an English language supplement of El País has been included in the Spanish version of the International Herald Tribune. This content can also be found on El País' internet site. In 2001 El País had a circulation of 433,617 copies and it was 435,298 copies next year. The paper had a circulation of 435,000 copies in 2003. El País was awarded the World’s Best Designed Newspaper™ for 2006 by the Society for News Design (SND). Based on the findings of the European Business Readership Survey the paper had 14,589 readers per issue in 2006. The circulation of the daily was 425,927 copies between June 2006 and July 2007. On 26 September 2007, the paper published the Bush-Aznar memo, a leaked transcript of a closed-door meeting between U.S. president George W. Bush and Spanish Prime Minister José María Aznar, shortly before the invasion of Iraq. In 2007 the circulation of El País was about 400,000 copies. During the premiership of the PSOE's José Luis Rodríguez Zapatero El País published several articles criticising or opposing the policies of the Zapatero government. This provided opportunities for new entrants to represent the radical left, such as the appearance of the daily newspaper Público. The 2008 circulation of El País was 435,083 copies, making it the second most read daily in the country, only after the sport-daily Marca. It was 267,000 in April 2014. In March 2015, El País, together with other international newspapers, founded an alliance called LENA. In June 2016, El País Brasil was found in a list of political newspapers that received money from the Workers Party government. El País has had five editors-in-chief since it was founded in 1976. In February 2014 it was announced that Antonio Caño would be proposed as new editor-in-chief, appointment that was ratified by the Board of Directors and became effective on 3 May 2014. In June 2018, Soledad Gallego-Díaz became the first-ever editor of El País. The appearance of El País is characterized by its sobriety, in both its treatment of information and its esthetics. Most pages contain five columns arranged in a neat and clear manner with distinct journalistic sub-categories. Photographs and graphics play a secondary, supporting role to the written word. The newspaper had had the same design from its foundation until the end of 2007, with hardly any changes (it used only black-and-white photographs, although the current format includes colour and more imaginative design, mainly in the varied supplements), and the same Times Roman font. The newspaper's format was revamped on 21 October 2007 with changes to its printed form, its digital presence on the Internet and the replacement of its historical motto 'Independent morning daily' with 'Global Spanish language newspaper'. The paper began to be published in tabloid format. Other notable changes are the inclusion of the acute accent in its title header and the substitution of Times Roman by “Majerit”, a specially-commissioned plain serif font..
Opinion polls cited in El País are all carried out by a separate company called Instituto OPINA. In the mid-1990s, El País was the second Spanish newspaper to publish an internet edition, El País digital (the first was the Catalan newspaper Avui). On 18 November 2002, it became the first Spanish newspaper to introduce a payment system for access to the contents of its electronic version, which drastically reduced the number of visits to the website, to the extent that El Mundo, which maintained open access to the majority of its contents, became the leading Spanish digital newspaper. After taking this decision El País digital was suspended in 2002 by the Oficina de Justificación de la Difusión for four months because of two serious breaches of OJD regulations. 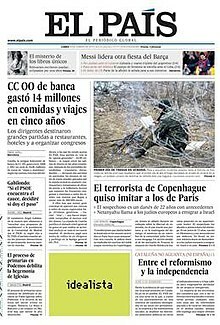 The El País digital website opened again on 3 June 2005 with free access to the majority of the contents. Subscription was required to gain access to multimedia contents and to the newspaper's archive. On 26 November 2013, El País launched a digital edition in Brazilian Portuguese. In October 2014, El Pais launched a digital edition in Catalan. Futuro, (English: Future) supplement on science. The New York Times, a Spanish language version of the American original. EP, previously known as El País de las Tentaciones, (English: The Country of Temptations) youth supplement. Ocio, (English: Leisure) supplement on cultural activities. El Viajero, (English: The Traveller) on travel. Negocios, (English: Business) financial supplement. The supplement designed for children, Pequeño País (English: Small Country), ceased publication in 2009. Classic and Modern Comics (1987). The paper's ideology has always been defined by a leaning towards europeanism, progressivism and social-liberalism. Politically, it was situated in the centre-left during most of the transition. It regularly criticized the Conservative government of Mariano Rajoy (2012–2015) over corruption scandals, economic performance and a "do-nothing" approach to the Catalan crisis. In the late 1970s and 1980s El País had close connections with the Partido Socialista Obrero Español (PSOE). The paper has repeatedly supported King Juan Carlos I for his contribution to the consolidation of democracy, especially, for his decisive intervention in aborting the coup of 23 February 1981. The paper is characterized by the amount of space it gives to the reporting of international news, culture and information regarding the economy, as well as Spanish news. It has specific columnists and contributors from different social backgrounds contributing to the democratic and pro-European editorial line of the newspaper. On March 11 2004 Spain suffered Europe's first jihadist terror attack with a nearly simultaneous, coordinated bombings against the Cercanías commuter train system of Madrid, Spain, on the morning of 11 March 2004 – three days before Spain's general elections. The day of the attacks, then prime minister José María Aznar, from the ruling conservative party called El Pais editor in chief Jesús Ceberio and gave him assurances that the attacks had been planned and executed by the basdque terrorist group ETA. Despite having no other confirmation, Ceberio ran a front page blaming ETA for the attack, having to correct course the following day. Ceberio, who would continue as editor for three more years, published and editorial piece accusing Aznar of manipulating him. On 24 January 2013, under Javier Moreno, El País published a false report about the health status of then Venezuelan President Hugo Chávez, with false photography of an unknown man from a 2008 video. The Venezuelan government announced legal action against El País, and criticized both the violation of journalistic ethics as well as the violation of the patients' rights of President Chávez and others. The paper has criticized figures such as Che Guevara and his idea of armed struggle. The 16 February 2012 edition of El País was banned in Morocco due to the publication of a cartoon which, according to the Moroccan authorities, tarnished King Mohammed VI's name. In January 2018 El País was sentenced to publish a rectification article after the Catalan TV channel TV3 denounced the newspaper for "harming the TV channel's image" with an article which contained "inaccurate data". A similar case happened between El País and the Catalan businessman Jaume Roures, with El País being sentenced after publishing Roures had 250 million Euros in tax havens. According to a report prepared the Parliament of the United Kingdom 'fake news' committee written by the non-profit organisation Transparency Toolkit published in April 2018, El País had published "numerous examples of misinterpretations of data sources, use of inaccurate information, lack of attention to detail and a poor research methodology" regarding the alleged Russian involvement in the Catalan independence referendum. It describes their conclusions as "exceptionally deceptive" and concludes "there may be a temptation to use groundless allegations of fake news to support political argument". ^ Lucinda Southern (30 January 2017). "How Spanish newspaper El Pais is tackling fake news". Digiday. Retrieved 31 January 2017. ^ Galluzzi, Anna (18 August 2014). Libraries and Public Perception: A Comparative Analysis of the European Press. Chandos Publishing. pp. 28–29. ISBN 9781843347446. ^ Blitzer, Jonathan (31 January 2012). "The Future Is Not What It Used to Be: On 'El País'". The Nation. Retrieved 28 June 2017. ^ Forcada, Daniel (7 June 2016). "'El País' consuma su giro a la derecha y ataca el apoyo mediático de Planeta a Podemos" ['El País' consummates its turn to the right and attacks Planeta's media support to Podemos] (in Spanish). El Confidencial. Retrieved 24 September 2018. ^ Keila Guimarães (26 November 2013). "El País lança edição digital no Brasil". Archived from the original on 3 May 2015. ^ "Medios Controlados « OJD". www.ojd.es. Retrieved 22 August 2018. ^ "Los 10 principales periódicos españoles bajaron en 2018 sus ventas en el quiosco". 30 January 2019. ^ "El juez aplaza el juicio por los despidos en el País por la incomparecencia de la directora". 30 January 2019. ^ a b "Principales periódicos por lectores diarios España 2018 | Estadística". ^ Kassam, Ashifa (25 March 2014). "Media revolution in Spain as readers search for new voices". The Guardian. ^ "Empresas: La deuda del Grupo Prisa vuelve a superar ya a su valor en Bolsa". 13 November 2018. ^ "El Pais - Corporativo". El Pais. Archived from the original on 5 January 2010. ^ "Cambia el Gobierno, cambia el director de 'El País'". ^ Alan Albarran (10 September 2009). Handbook of Spanish Language Media. Routledge. p. 20. ISBN 978-1-135-85430-0. Retrieved 29 October 2014. ^ Breve historia de El País Archived 20 May 2013 at the Wayback Machine, El Pais. ^ Francisco J. Pérez‐Latre; Alfonso Sánchez-Tabernero (2003). "Leadership, an essential requirement for effecting change in media companies: An analysis of the Spanish market". International Journal on Media Management. 5 (3): 199–208. doi:10.1080/14241270309390035. ^ Nuria Almiron; Ana I. Segovia (2012). "Financialization, Economic Crisis, and Corporate Strategies in Top Media Companies: The Case of Grupo Prisa". International Journal of Communication. 6: 2894–2917. Retrieved 9 July 2013. ^ a b c Katrin Voltmer (2006). Mass Media and Political Communication in New Democracies. Psychology Press. p. 19. ISBN 978-0-415-33779-3. Retrieved 28 November 2014. ^ a b Frank R. Baumgartner; Laura Chaqués Bonafont (2014). "All News is Bad News: Newspaper Coverage of Political Parties in Spain" (PDF). Political Communication. Retrieved 4 December 2014. ^ Four freedoms awards Archived 25 March 2015 at the Wayback Machine Roosevelt Institute. Retrieved 21 April 2015. ^ Rosario de Mateo (1989). "The evolution of the newspaper industry in Spain, 1939-87". European Journal of Communication. 4. Retrieved 17 April 2015. ^ «Eva Cuesta, el penúltimo fichaje del PSOE en PRISA». Artículo de Periodista Digital (24 January 2007). ^ «Prisa y PSOE se apoyan mutuamente para seguir en el poder: dinero y publicidad a mantas Archived 31 March 2010 at the Wayback Machine». Artículo de Por Andalucía Libre mencionando declaraciones de El Mundo 7 February 2007. ^ "Sogecable responde a la llamada del PSOE y pide al Gobierno que Canal+ emita siempre en abierto", Artículo de Libertad Digital, ya solo consultable en TodoInternet.com. ^ País, Ediciones El. "In English". EL PAÍS. ^ Jagdeep S. Chhokar; Felix C. Brodbeck; Robert J. House (17 June 2013). Culture and Leadership Across the World: The GLOBE Book of In-Depth Studies of 25 Societies. Routledge. p. 644. ISBN 978-1-135-70380-6. Retrieved 31 January 2015. ^ Andrea Czepek; Melanie Hellwig; Eva Nowak (2009). Press Freedom and Pluralism in Europe: Concepts and Conditions. Intellect Books. p. 279. ISBN 978-1-84150-243-4. Retrieved 12 December 2014. ^ "El País on Bush, Aznar, and Iraq". Harper's Magazine. September 2007. ^ a b Anne Penketh; Philip Oltermann; Stephen Burgen (12 June 2014). "European newspapers search for ways to survive digital revolution". The Guardian. Paris, Berlin, Barcelona. Retrieved 7 January 2015. ^ "El País critica al Gobierno y destaca el "desánimo" en el PSOE con Zapatero". Libertad Digital. 14 September 2009. ^ Catarina Alencastro; Paulo Celso Pereira (18 June 2016). "Temer suspende patrocínio de R$ 11 milhões para blogs políticos". O Globo. Archived from the original on 22 June 2016. Retrieved 6 September 2016. ^ Jones, Sam (8 June 2018). "Spain's el País newspaper appoints first female editor". The Guardian. ^ «Unos buenos tipos». El País 14 October 2007. ^ "Majerit | Feliciano Type Foundry". ^ «La OJD sanciona con cuatro meses de expulsión a El País Digital por faltas graves». ABC. 24 July 2002. ^ El País comemora dois anos no Brasil, Meio&Mensagem, 30 November 2015. ^ "El Pais to launch new men's magazine Icon". Publicitas. 19 July 2013. Archived from the original on 24 September 2015. Retrieved 19 August 2015. ^ Antonovica, Arta (14 July 2012). Comunicación e imagen de los países bálticos en España a través de la técnica del discurso periodístico. Librería-Editorial Dykinson. p. 111. ISBN 9788490315453. ^ Cué, Carlos E. (16 November 2014). "Rajoy sobre Cataluña: "Tendré que explicar mejor mis razones" | España | EL PAÍS". El País. politica.elpais.com. Retrieved 20 November 2015. ^ «Injurias a la Corona». Editorial de El País (28 July 2007). ^ EL PAÍS retira una falsa foto de Hugo Chávez | Internacional|El Pais 24 January 2013. ^ "Spanish Paper El País Makes a Fool of Itself | venezuelanalysis.com". venezuelanalysis.com. 24 January 2013. Retrieved 20 November 2015. ^ "Venezuela to take legal actions against El Pais | AVN". avn.info.ve. Retrieved 20 November 2015. ^ Caudillo Guevara, editorial de El País, 10 October 2007. ... Che Guevara [..] belonged to that sinister saga of tragic heroes, still present in the terrorist movements of various types, from the nationalists to the Jihadists, who try to hide the fact they are assassins by claiming to be martyrs, prolonging the old prejudice inherited from Romanticism. The fact that Che Guevara gave his life and sacrificed those of many others does not improve his ideas, that drink from the springs of one of the great totalitarian systems. [..] the only attestable contribution of the insurgent followers of Guevara to Latin American politics was to offer new alibis to the authoritarian tendencies that were germinating on the continent. Thanks to his armed challenge, the right-wing military dictators could present themselves as a lesser evil, if not a inevitable requisite opposing another symmetrical military dictatorship, such as that led by Castro [..] In the four decades that have passed since his death, the Latin American left and, of course, that in Europe, has completely expedited his goals and fanatical methods. To the point where today the only people who commemorate the date of his execution in La Higuera are the governments that subjugate the Cubans or those that invoke Simón Bolívar in their populist harangues. ^ "Morocco bans Spanish paper over royal cartoon". Doha Center for Media Freedom. 19 February 2012. Archived from the original on 15 October 2014. Retrieved 8 October 2014. ^ "El País, condenado a publicar una rectificación por un artículo crítico con TV3". Ver Tele (in Spanish). 11 January 2018. Retrieved 21 April 2018. ^ "'El País', obligado a publicar otra vez la rectificación sobre las cuentas de Roures que falseó". Público (in Spanish). 11 April 2018. Retrieved 21 April 2018. ^ Meseguer, Marina (20 April 2018). "Un informe para el comité británico sobre 'fake news' tumba la teoría de la "injerencia rusa" en la crisis catalana". La Vanguardia (in Spanish). Retrieved 21 April 2018. ^ "Un informe encarregat pel parlament britànic trinxa la manipulació d'El País sobre les 'notícies falses' de Catalunya". VilaWeb (in Catalan). 20 April 2018. Retrieved 21 April 2018. This page was last edited on 24 April 2019, at 02:52 (UTC).